Amos and Amos were appointed by Ballymore to redesign the interior layout of the penthouse and sub-penthouse at 21 Wapping Lane to create a well defined and luxurious space that does justice to its setting and spectacular views. Our design approach for Wapping Lane was to create a penthouse interior that represents a true departure from the norm. The setting was one of the main factors that led to us deciding on a more innovative approach that sought to create a very clear sense of place with strong links to its location. The result is a contemporary luxe interior that balances immaculate detailing and bespoke design with a carefully selected material palette evoking a strong metropolitan feel. The layout was re-planned in its entirety to create a clear hierarchy of spaces throughout the penthouses. Firstly we wanted to celebrate a true master suite, on a par with what one would expect to find in the suite of a luxury boutique hotel. A completely open space was created, featuring a walk through wardrobe behind the master bed, and an open bathroom incorporating two countertop basins, minimalist disc operated taps, and a dramatic freestanding cast resin bath and tap with views stretching to Canary Wharf. A separate WC links to the bathroom, both of which are set against marble tiled floors and walls. The master bedroom has direct terrace access with far reaching views. The second bedroom does not feel in the slightest way secondary, featuring a private terrace, luxurious ensuite with a large shower and bath and walk-through wardrobe. The third bedroom sits between the two, and is a perfect guest bedroom with built in wardrobes and terrace access. The living area is a large sweeping space: a true entertainment environment. The semi professional kitchen incorporates stainless steel, a chef’s tap, Gaggenau appliances and cooker hood, and a Falcon range cooker. Basaltina stone worktops sit over lacquered cabinets with oak veneered interiors, whilst the breakfast bar sets itself apart with a timber, butcher’s block style surface offering casual eating with views across the city. The dining area is located directly adjacent to the kitchen, making it perfect for hosting and entertaining guests. A new sculptural spiral stair was designed to access the roof terrace, through a glass sided sunroom on the 19th floor. 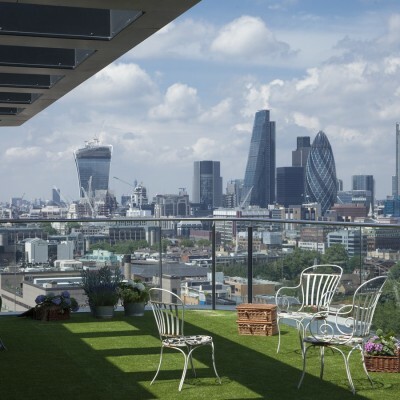 The roof terrace offers uninterrupted 360 degree views across the capital. The main living space is divided into three specific areas. 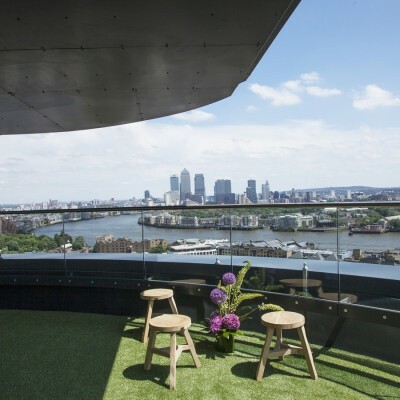 Firstly a workspace set in front of floor to ceiling glazing offering views to the Shard and Tower Bridge. Next to the workspace is a comfortable seating area with two armchairs, designed for reading and relaxing by a bespoke designed walnut LP unit. The main entertainment space sits under a coffered ceiling, and includes a vast L shaped sofa, armchairs, and bespoke media unit with integrated concealed drinks cabinet and gilded metal shelving. A floor to ceiling integrated mirror reflects the cityscape into the space, and Tom Dixon pendants hang above a mid century inspired sofa with integrated smoked oak side tables. 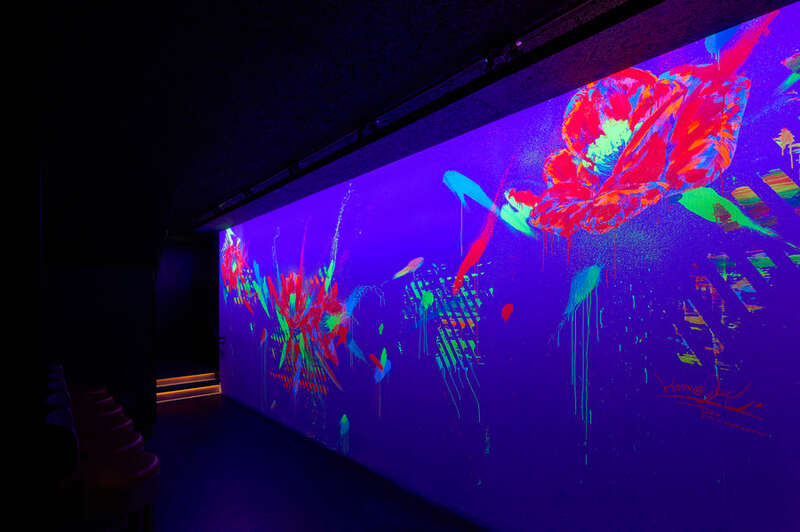 The Wapping location has become synonymous with creativity and innovation, located in the heart of the city. We wanted to reflect this quintessential London feel with a very considered and careful approach to furniture choices. From armchairs to side tables, lighting to cushions, we sought to champion contemporary British and London based designers, and showcase up and coming as well as established homegrown talent. Specifically, this includes pieces include items by Dare Studio, Bethan Gray, Pinch, Lee Broom, Tom Dixon, Buster and Punch, Eleanor Pritchard and A Minds Eye. Bespoke design by Amos and Amos. Sanitary and brassware by Time & Space London Ltd.
As per standard Wapping spec. Manufacture by Robert Timmons Furniture ltd. Fully integrated Gaggenau appliances – wine fridge, coffee machine, dishwasher. Stainless steel double door fridge, freezer drawer and cooker hood. Extra wide (300mm) European Oak flooring throughout with a grey oil finish. Flooring by Vudex. An eclectic range of architectural lighting by Nud, & tradition, Tom Dixon, Buster and Punch, Lee Broom, Gubi and Foscarini. Bespoke headboard designed by Amos and Amos – walnut framed with quilted plum velvet upholstery, and brass stud buttoning detail. Wardrobe sliding doors in grey oak veneer with soft sage lacquered interiors and gilded metal rails. Wardrobes incorporate full and half height hanging rails, open shelving and drawers. Bespoke headboard by Amos and Amos – walnut framed with pale blue vertical quilted upholstery.